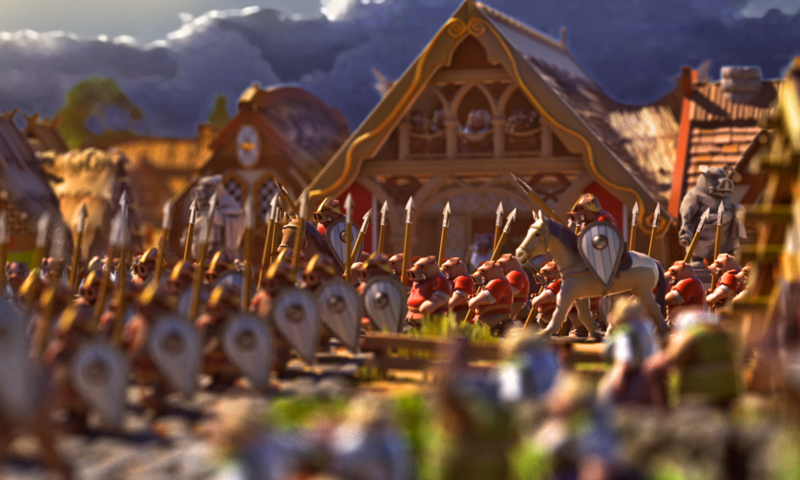 The basics of multi-player Nations have been implemented into Ymir! It is now possible to gather several players into a common Nation. They will therefore share the same Nation name, color and standard. Nations have a fully customizable hierarchy. You can create different titles with custom names and rules such as tax rates to superiors, methods of succession and replacement (when a player becomes inactive) or rights ( allowed to promote subordinates, can recruit new people in the nation… etc). This is the foundation of the Nation system, and more features will be added to it in the future. Each player now has a government name that gets combined with his rank title from his Nation. – Perks: shared score and victory points, automatic system of taxation and management of inactive players within the nation. – Disadvantages: costs state power to maintain the more subordinates one has under him and the more distant they are, making the leaders likely to compensate this by using taxation. ego to renounce your own flag. The new Nation menu allows you to see the Nation’s current hierarchy and titles. Only the Nation leader can modify the title names and properties. When a nation member becomes inactive, a succession happens. One of the succession methods is an election including all his active subordinates who will have to choose who among them will replace the inactive player and take his role. Territorial claims have been added. 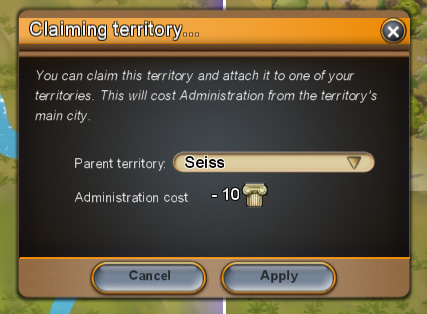 Its the foundation of multi-territory regions: instead of the previous one region = one territory ( 1 world tile) , regions can now regroup several tiles under a parent territory : the region’s city. For now though, the only and first type of regional territory is the aforementioned “territorial claim”, which is simply a way to include empty territories into your frontiers to establish control over the neighboring lands. Claiming lands costs administration to the parent territory (the city) they are attached to. The ownership of these territories is also inherited from the city, so invading it will also mean taking control of all the region’s annex territories. Nations and territorial claims now allow for the creation of actual countries composed of multiple regions belonging to multiple players, all linked together into one continuous territory. Claiming a new territory costs administration to the parent region it’s being attached to (proportionally to its distance from that region’s capital city). Resource storage has been improved : extra resources no longer spawns ‘ground storages’ that fills up the map when there’s no space available. Instead, they spawn directly on the floor. Such resources decay with time and will be lost unless stored quickly in a proper storage. If room is available, they will automatically relocate into one, in the same way slums disappear when room is made available in regular housing. New resources now also go in priority into large warehouses before filling up smaller 2×2 “ground storages”. – a new resource will first tries to go into a proper warehouse. – if no room is available, it will try to go into ‘ground storages’. – if none is available, it will spawn directly on the floor and will decay with time, trying to relocate if room becomes available. 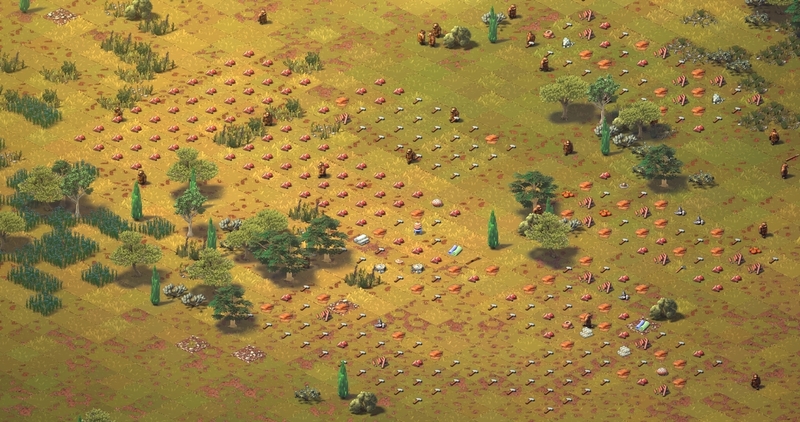 If no room is available, extra resources now spawn directly on the floor and will decay unless stored properly. Besides that, the patch includes important optimizations for larger cities, making it much more comfortable in later game. – added nation hierarchy: multiple players can group in a same nation with a customizable hierarchy of superiors and subordinates. 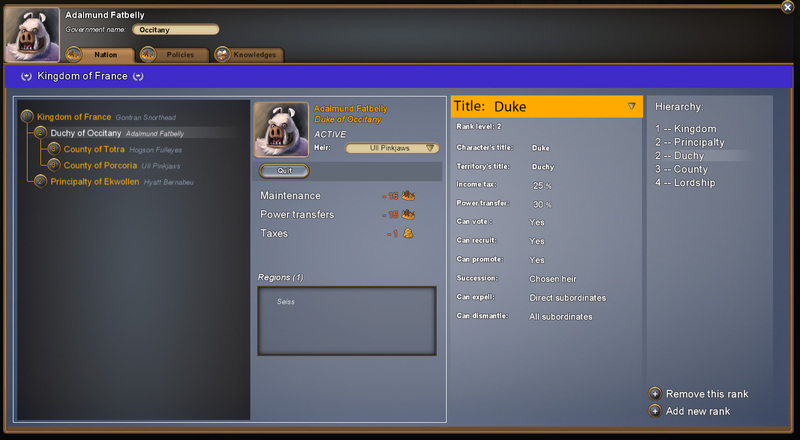 – added nation titles: customizable faction ranks, with specific settings and names affecting all the members of a rank. – added nation taxation: superiors can levy a tax on their subordinates, taken from their raw income. 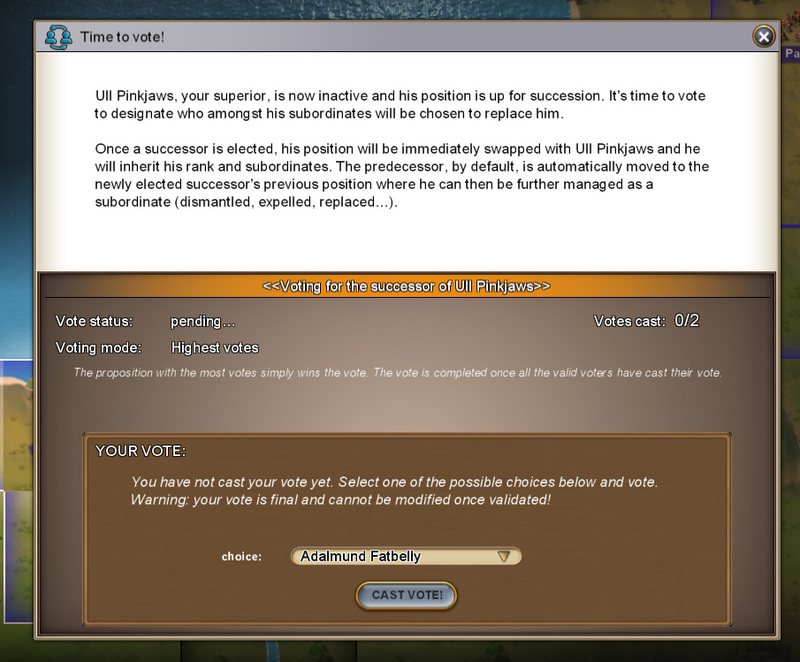 – added nation state power transfer: subordinates can transfer some state power to their superior. – added promote: if allowed by his rank, a superior can affect rank of subordinates. – added replacement: if allowed by his rank, a superior can replace an inactive subordinate by another one in the hierarchy. – added dismantling: if allowed by his rank, a superior can redistribute the territories of an inactive subordinate. – added expellment: if allowed by his rank, a superior can expel an inactive subordinate from the nation. – added heirdom succession: a nation member can name an heir that will automatically be offered his title if he were to become inactive. – extra resource no longer spawn 2×2 ground storages. They spawn directly on the floor and decay with time. like slums for houses, they auto relocate if space is available. – new resources now go into warehouses/granaries in priority before going into ground storages or directly on the floor. – added multi-territorial regions : a city can now “own” adjacent territories. Their ownership is synced with the parent city. 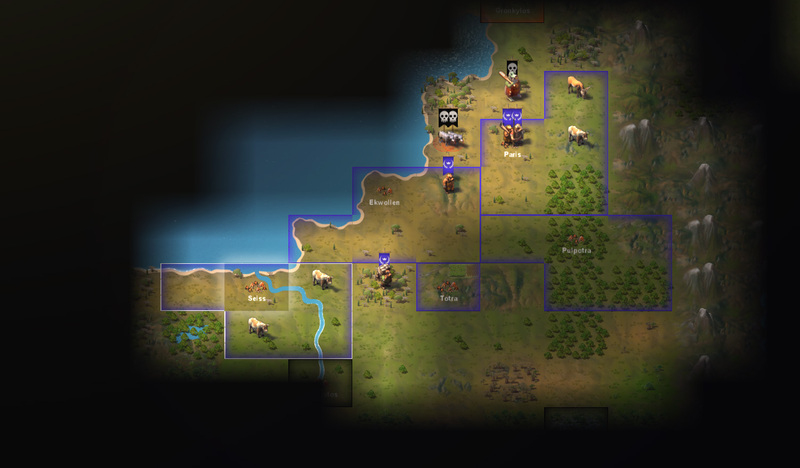 – added territorial claims: expands your frontier over empty territories. costs administration from the parent city. For now its the only available regional territory type available.